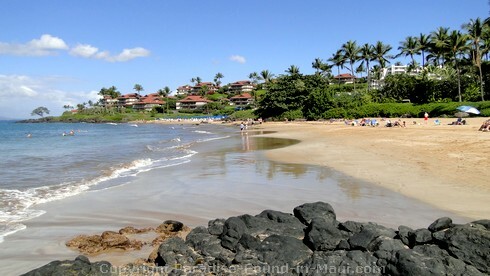 Polo Beach in Wailea, Maui, is a lovely crescent of white sand fronting the massive Fairmont Kea Lani Resort with beautiful views of Molokini Crater and Kaho'olawe. 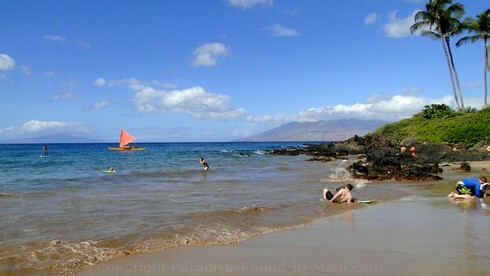 This was the last beach that we stopped at on a recent trip, and it made for a perfect end to our time in Maui! We found a lovely shady nook just around the corner from the beach entrance that was perfect for our boys to play in the sand with no fear of a sunburn. But if the sun is what you seek, not to worry, there was far more sun than shade on this beach! 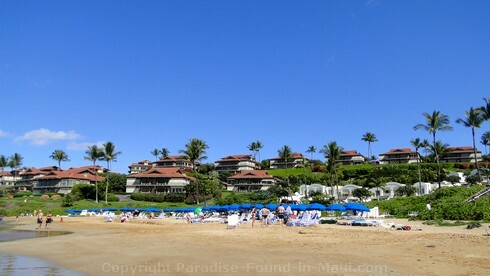 This beach can also be great for snorkeling at the rocky points near the condos to the north and also to the south end near the Polo Beach Club. (Read more about the PBC) If you plan to snorkel here, be sure to come earlier in the morning to maximize your odds of having calm water. Another fun activity if the water is calm would be to try standup paddleboarding. By the afternoon, the waves picked up a lot, making for a lot of fun boogie boarding. In fact, a big swell came in the afternoon we were here, causing me to get tossed around and totally dunked by a few huge rogue waves. But it's all good - the dunking cooled me off and braving the waves was totally worth it for the thrill of racing into shore on a boogie board! A word of caution: there are no lifeguards at this beach, so you're on your own once you enter the water. If you get restless, there is a pretty black rock stone beach to the south that would be fun to explore and see where it takes you. 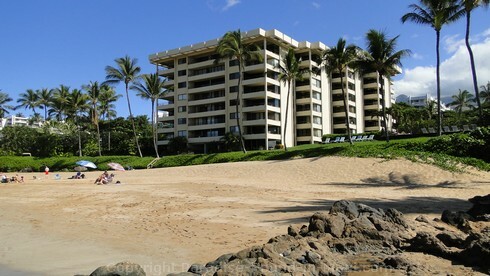 You can also check out the beach walk in front of the Fairmont, and follow it north all the way to Wailea Beach. 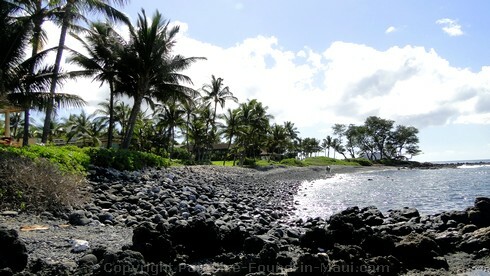 Another nearby spot that's fantastic for snorkeling is Maluaka Beach Park. 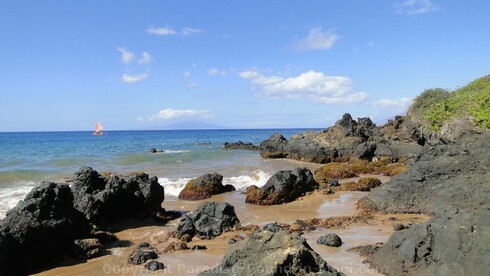 One of several spots on Maui known as "Turtle Town," there are this is one of the best beaches to see the magnificent sea turtles in their natural habitat. This beach has all of the amenities you could possibly need for a day at the beach: a grassy picnic and BBQ area, restrooms and showers. 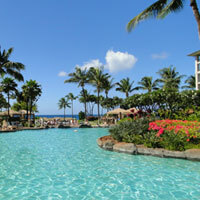 Plus, the Fairmont Kea Lani is right behind the beach, giving you some nice options for take-out food if you wish. 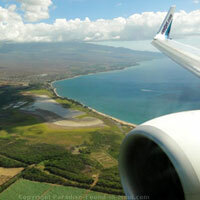 To get here, drive south past the Shops at Wailea, past the Four Seasons and a little ways past the driveway for the Fairmont Kea Lani Resort. 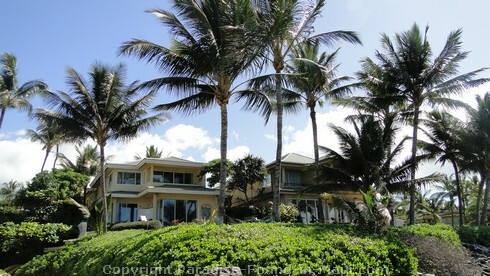 (If you find yourself driving by the golf club, you went too far.) 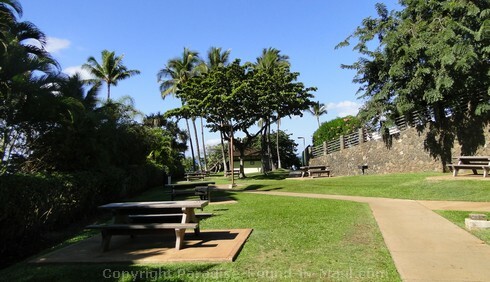 Make a right turn onto Kaukahi Street and follow it to the end where you'll see a parking lot on your right with a blue beach access sign, plus a larger green beach park sign. 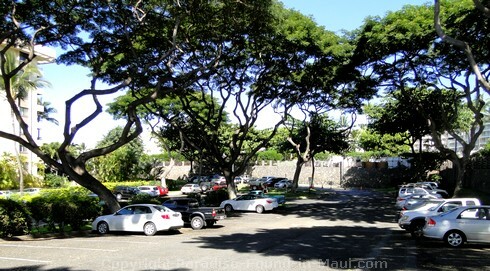 It's the parking lot just before the Polo Beach Club Maui. One of the nice things about the parking lot for this beach is that there is a ton of space - it's far larger than those for most (maybe all?) of the other beaches in the area. Plus, there are a lot of trees scattered about so if you're lucky, your car will be in the shade all day and won't get as hot inside as it would if left in the sun. 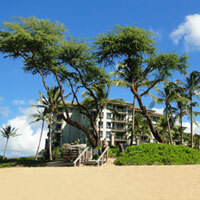 Polo Beach in Wailea, Maui, is open daily from 7 a.m. until 8 p.m.